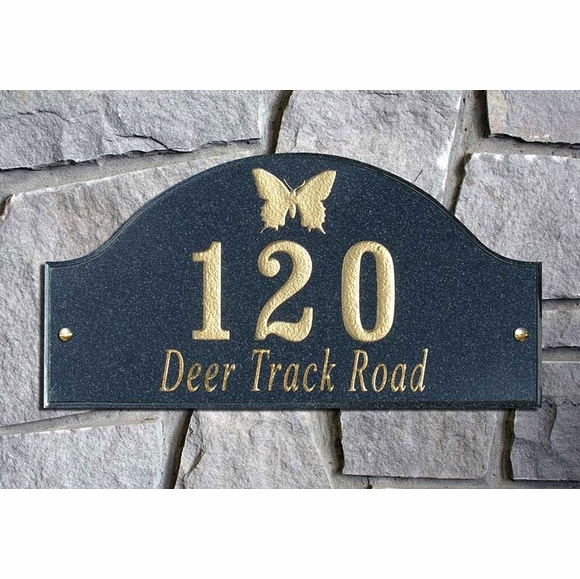 Personalized Animal and Wildlife Address Plaque - - made from solid granite includes an animal or wildlife logo. Choose from bass, bear, bull, butterfly, cat, dinosaur, dog, elephant, elk, moose head, flying ducks, flying pheasant, frog, hammer head shark, heron, horse, horse head, lion, marlin, rhino, rooster, running horse, salmon, shark, whale, and wolf. Plaque is made with solid granite and features your choice of shape, granite color, letter/animal color, and font style. Animal or wildlife image is the same color as the letter color you select. Please type your text exactly as you want it to appear. You can use both upper and lower case letters. In addition, you can use a different font on each line as shown above. Wall mount or attach to a set of lawn stakes (sold separately, item 71731F, see Related Products). Letter/animal/wildlife colors: black, white, mocha, gold.